last night I made the decision to set my alarm clock for 15 minutes earlier so that I would have enough time to have breakfast with Ryan. 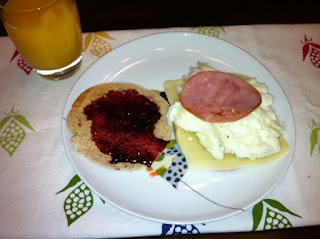 Breakfast this morning was my favorite combination of sweet and savory. I used a 100 calorie wheat sandwich thin and topped it with a slice of reduced fat mozzarella cheese, a serving of egg whites, 1 slice of Canadian bacon, and then I smeared the other half of the sandwich with blackberry jam. So so so good. All washed down with some orange juice. Best part of the whole meal was sitting down with Ryan at the table and not scarfing it down while racing to work like usual. So far it's been a good Tuesday. How is everyone else's Tuesday morning coming along? Remember to take an extra 15 minutes today for yourself. Take the long way home ... stay at the gym a little longer ... walk your dog an extra block ... read a few chapters of your favorite book.